Now is your chance to purchase a wide variety of affordable art and unique crafts at the 10th Annual Downtown Venice Craft Festival this weekend. Due to the Venice Beautification Project the Festival will move from its usual location on Miami Avenue to 401 W. Venice Ave., in Front of City Hall. As an added bonus, the Venice Farmer’s Market will be taking place on Avenues Des Parques alongside the Craft Festival, and both will run from 10 a.m. to 4 p.m. on Saturday, Sept. 1, and Sunday, Sept. 2. “We are excited to partner with Venice Farmer’s Market as this will be a great opportunity for locals to visit with all the vendors in person,” explained Erin Silk, Chief Executive Officer for Venice MainStreet, Inc.
Festival organizers expect over 100 artists and craftspeople to participate this year. A Green Market will offer live flora, freshly popped kettle corn, gourmet spices, and sauces. Arts and crafts will include a wide variety of ceramics, jewelry, stained glass, metal sculpture, photography, paintings, jewelry, candles, clothing, hats, hair accessories, paper collage, books, and soaps/lotions. 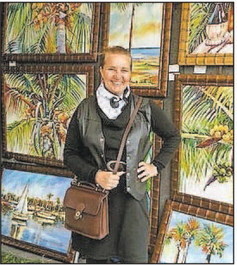 Favorites include Rasa Saldaitis, paintings; Gretchen Singh, pottery; John Grammer, stainless steel sculptures; Peter Lakiotis, pet accessories; Janet Campagna, children’s and dolls’ outfits; and Joyce Slate, jewelry. Lithuanian born oil & acrylic artist Rasa Saldaitis relocated to the United States in 1994. “My European background and experiences in America heavily influence my paintings. They reflect my love for color and the world around me.” she writes. Gretchen Singh creates jewelry storage organizers, sage and blue ring holders, mugs, planters, soup bowls, pie plates, and more-all dishwasher, microwave and oven safe. See her work on www.custommade.com/ potterybygretchen. Joyce Slate designs fine silver jewelry. “I have different styles, each inspired by a love of the sea, archology, ancient history, or mythology,” she writes on her website www.mythosjewelry.com. For 30 years Janet Campagna has been selling distinctive children’s clothing with matching doll’s outfits. “Each year I create my own patterns and design a new line of boys and girls clothing, so customers will always find something different at every show. Our dolls with matching outfits come with a variety of eye, skin, or hair color, and a personalized heart,” said Campagna. Metal Sculptor, John Grammer, specializes in crafting sea life such as tarpon, tuna, dolphin, stingrays, barracuda, and turtles. Grammer creates unique stainless steel pieces that he colors using only a heat technique that produces a rainbow of permanent colors. “Marine grade stainless will never rust even in salt, and no finish is needed. I attach a metal hook in the back of every wall sculpture at the ideal balancing point, and every piece is signed and dated,” explains Grammer. View his work at www.Johngrammerart.com. For more information, call 941-484-6722 or email: info@venicemainstreet.com. Rasa Saldaitis’ many colorful scenes may be found at her booth during the Venice Craft show this weekend. John Grammer will be displaying stainless steel sea life sculptures for sale at the Venice Craft Festival on Saturday-Sunday, Sept. 1-2.